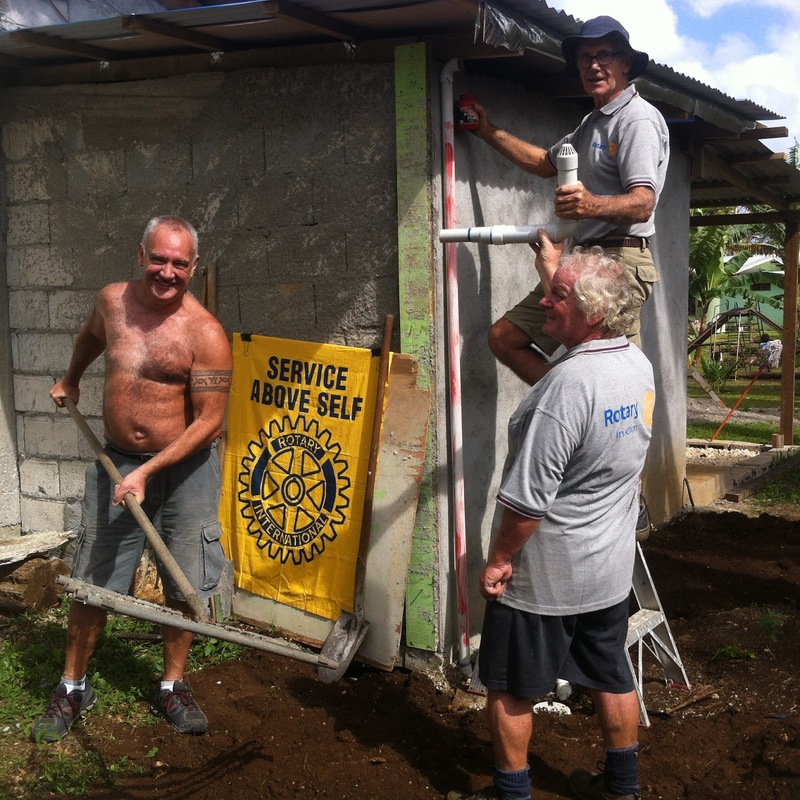 The Rotary Club of Port Vila held a working bee at the Sama Sama Rainbow School at Ernas, Vanuatu. “Sama sama” means happiness and rainbows signify a bright and colourful new beginning, hence the name for the school. The school was founded in 2009 by Ruth Carlot who is the Headmistress and it is situated on her family’s land. The school has 55 pupils from ages 3 to 10 plus another student aged 13. Before Cyclone Pam on March 13, the school had two teachers to assist Ruth, but because of the hardship caused by the cyclone, parents have not been able to pay school fees as before, so the teachers have had to be put off until funding can be secured again. If they are not teaching, the teachers become home gardeners working full-time to grow enough vegetables to be able to feed themselves and their family. The cyclone has destroyed all of the local gardens and stripped all the fruit trees, so subsistence farming is very desperate. Papaya, bananas and coconuts which are usually abundant are still scarce, as are most other staple produce the ni-Vanuatu rely on for their existence. The school which has been constructed to a very high standard was built by Ruth’s son, who is a professional builder, and her husband. Students have also helped decorate the classrooms. A group of Rotarians from Victoria, Australia, travelled to Vanuatu to play cricket in an over 60’s competition in June and tiled one of the school rooms, painted desks and did lots of improvements while they were here. Rotary Club of Warragul Chairman of Avenues of Service, Sally Jones, was among them and she followed up offering more assistance for the school. The next goal is to tile another classroom and to provide some resources, such as a projector and library books. Currently all the resources of the school reside on just two shelves 2.4 metres long in the headmistress’ office. While enjoying Rotary Club of Port Vila’s lunchtime meeting, Sally’s crew challenged Rotarian Morgan Brag to raise a team for next year’s Over 60’s Cricket Tournament. Morgan quickly put up his money with a bet that he could do it and he was very enthusiastic, but now he has to find enough members who will admit to being over 60 and capable of batting and bowling. Our French club members describe cricket as, “that game where you don’t do anything,” so he could rope some of them in if any of them are over 60. The Port Vila Rotary club, under the guidance of Rotarian Bruce Larkin, undertook to install toilets and washing facilities for the school. Rotary concentrates on projects concerned with either health, education or water and sanitation issues, and this project included all three. The plumbing design was put together by Rotarian Steve Roberts of South Pacific Plumbing. On the last weekend in September, the club worked on the finishing touches: members covered the septic tank with topsoil to hide it and make the area safe for children to play; completed the upstream sewerage vent; and did minor repairs to toilets and shower. A small team of enthusiastic Rotarians assembled accompanied by Sarah Kernot. Chris Kernot was quick to take off his shirt to display his rippling muscles and get into it, so shovels and dirt were flying everywhere. He looked like Tarzan in action! It was a good end result; the job got done with all the usual Rotary working bee good humour and banter.